More and more brides build their special day around a theme and Demetria Maratheftis of Greek origin and her groom Alex Alibert, were no exception. 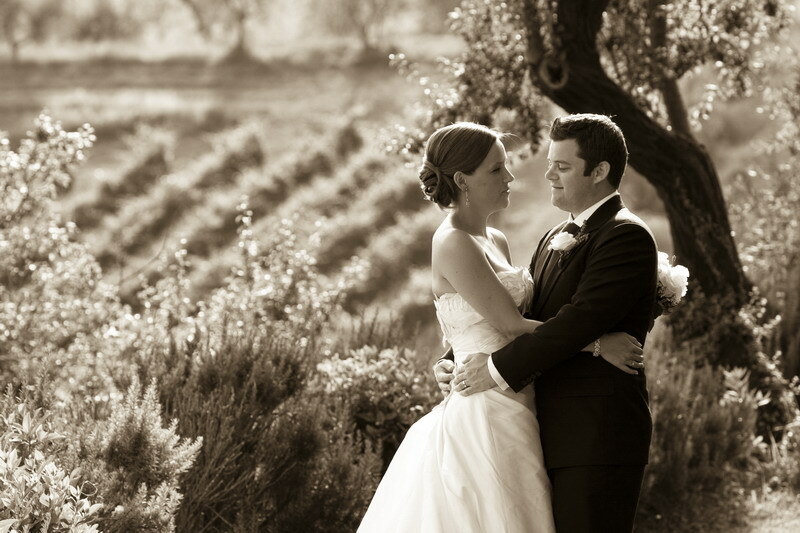 They were determined to have a wedding in Tuscany themed around the celebration of the senses. The day began with a beautiful catholic ceremony in the Santa Maria a Chianni, followed by a gorgeous reception in the beautiful Villa Gambassi, situated in a small ancient hamlet in Tuscany. The luxury villa with a private pool is steeped in history and surrounded by idyllic countryside with several acres of oak forests. 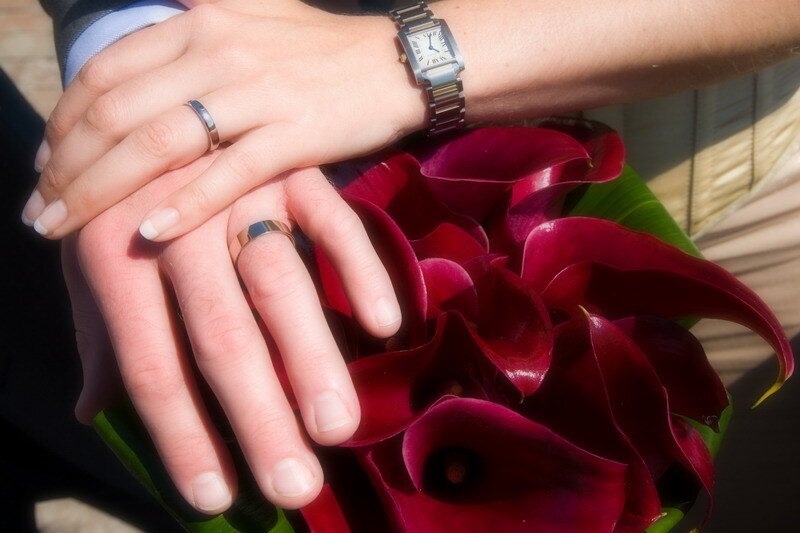 The property has been completely renovated and it is the ideal setting to organize small to medium size weddings. 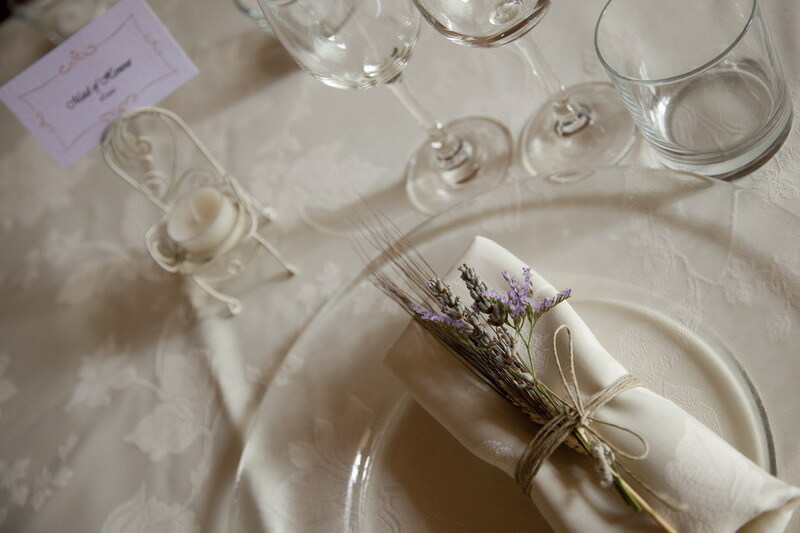 Erica Bellini, founder of Tuscan Dreams, planned the couple’s wedding, with a request to cater for all the senses throughout the day. 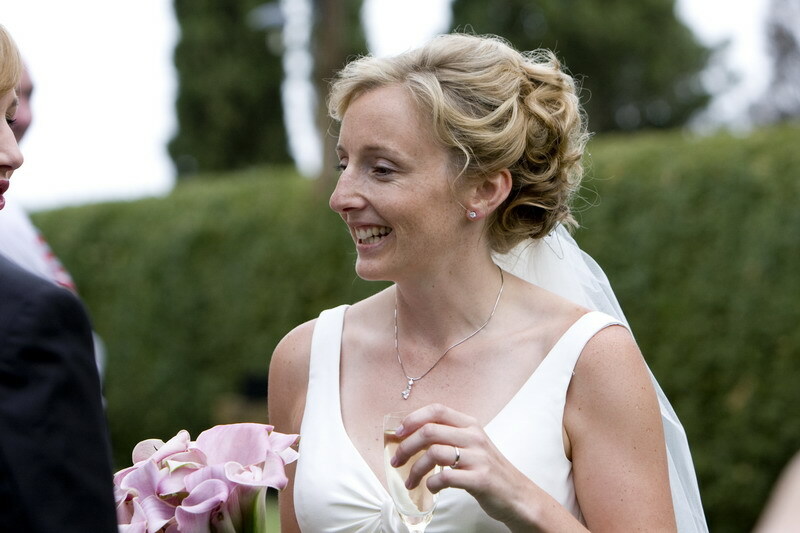 With over 10 years experience organising weddings in Tuscany, Erica knows that with careful event planning couples can achieve their perfect day in a perfect setting, no matter how elaborate or different their desires! 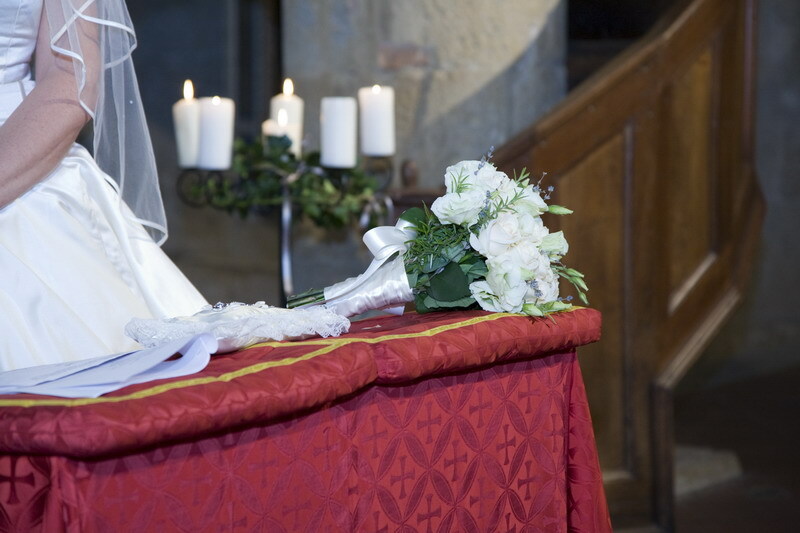 There was also a Greek marriage ritual in which the bride’s mother placed incense sticks around the room and wrapped a red scarf around the bride three times. 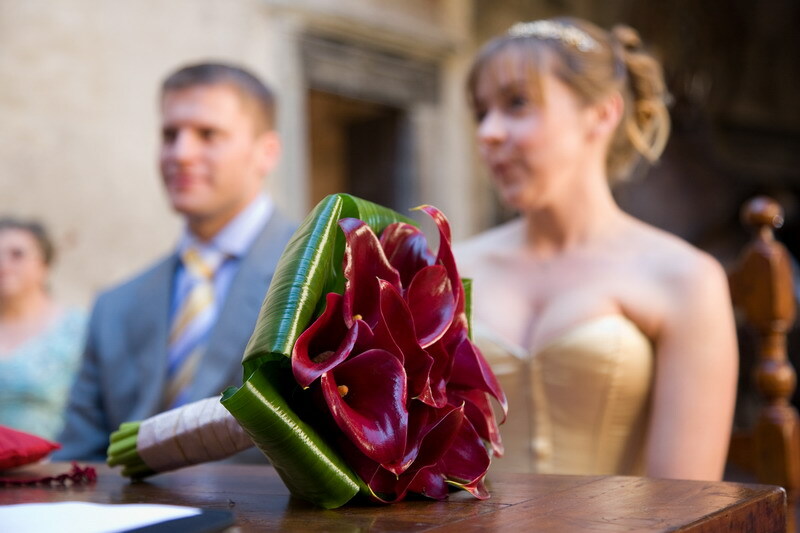 “This symbolises fire and was thought to protect the bride from evil spirits in ancient times” said Erica. Their wedding was held in September, a time when the vineyards will either still be full of ripe grapes or without grapes but the leaves will have turned into a million shades of colours, either are a feast for the eyes. • May/June when the countryside is still green and poppy fields still in bloom. 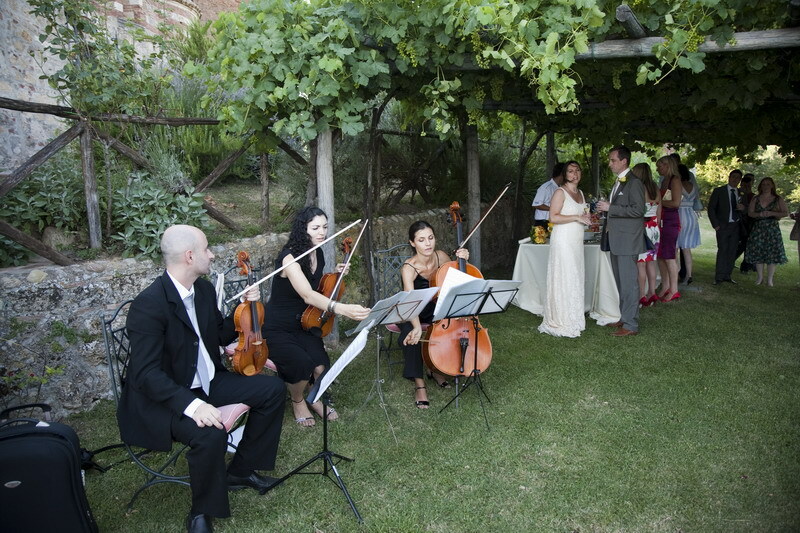 Entertainment came in the form of a string trio and soprano during the ceremony and during the evening a DJ played traditional Greek songs as well as English tunes that got everyone up dancing. • Spend money on an incredible band, rather than lots of entertainment. • Live music as opposed to pre-recorded music makes a terrific difference to the party. • Downloading music to an iPod is the cheapest option but make sure not to over use it. For the most emotional (the ceremony) or energetic moments (evening dancing) of the wedding day make sure that you have live music to make it unforgettable. 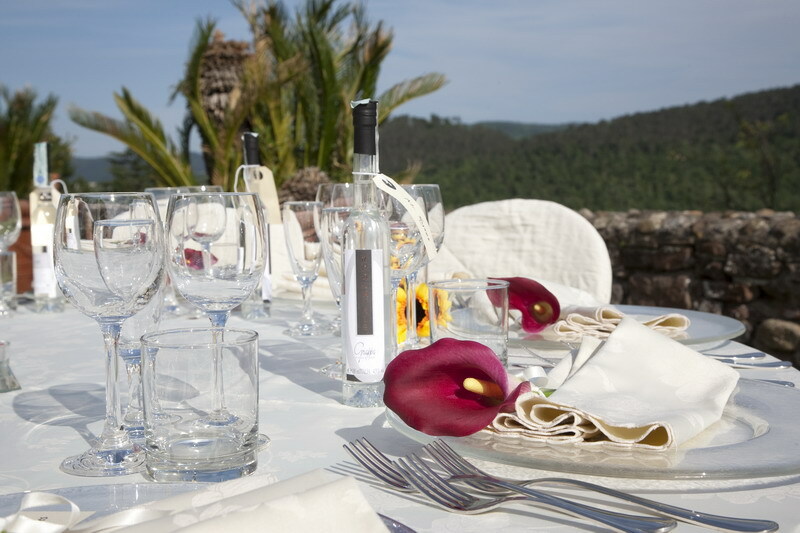 You can use the iPod during canapés or as background music during the sit down dinner. 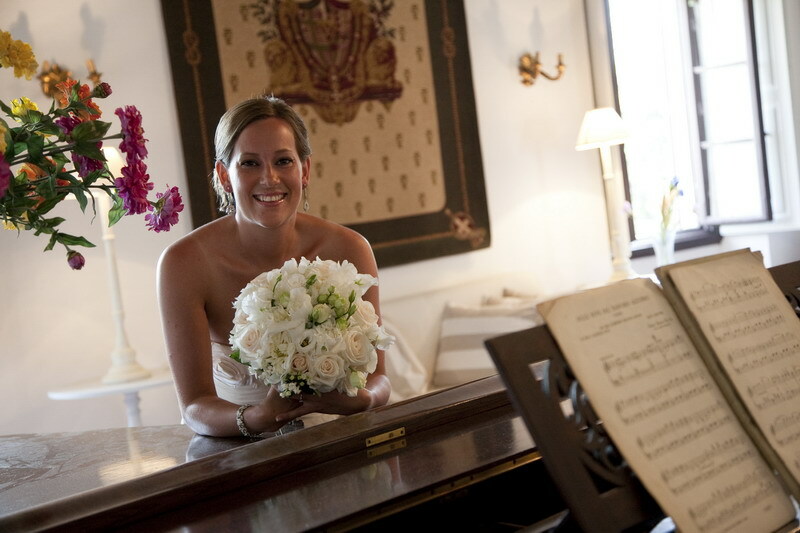 • It’s a great plus to have musically talented friends or family perform during the wedding day. It will make the day unique and special. 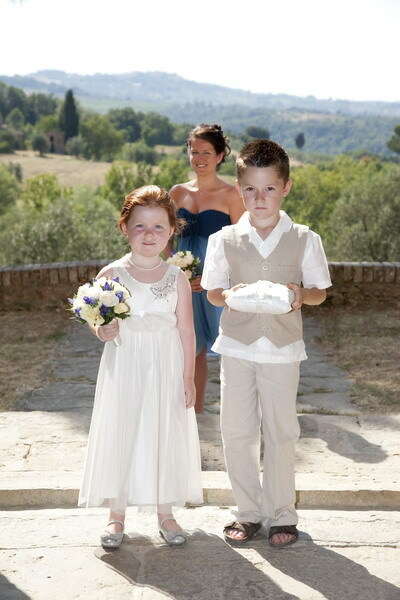 Stress free and stunning – The perfect Tuscan Wedding for less than the price of a designer wedding dress! It was ball of wool that initially brought Richard and Kirsten Hossack together. Kirsten, 37, had bought the wool to try and teach her niece to knit and on the way to the canteen began talking about it to fellow IT consultant Richard. Within a year the wedding was booked despite the fact that Richard, 34, later admitted he hadn’t got a clue what Kirsten had been talking about but hadn’t said anything because he didn’t want to appear stupid! Both loved Italy and wanted to marry in Certaldo, the home of the Italian language but realised very early on they needed expert help to make it happen and to make it happen for £2500! 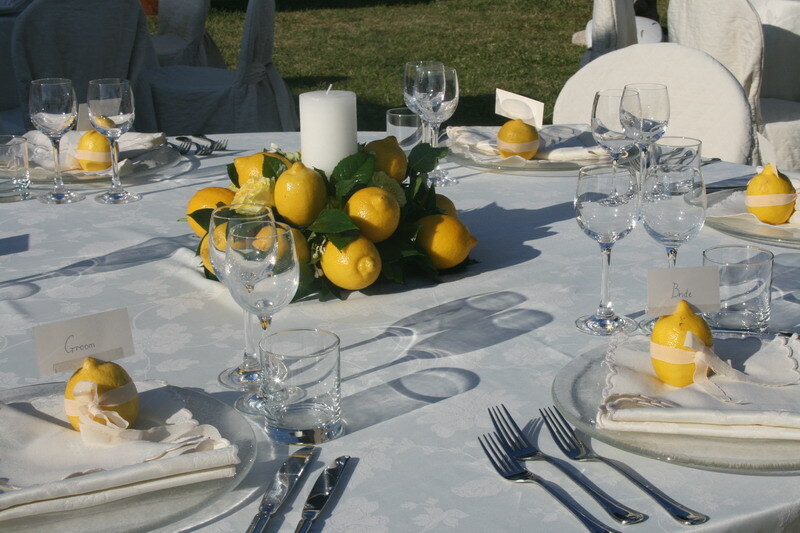 Erica Bellini, Wedding organiser for Tuscan Dreams, specialises in Tuscan weddings of all sizes and has arranged more than 50 celebrations so she quickly arranged the small but exquisite ceremony, wedding breakfast and accommodation. Kirsten says: “Once we had called Erica all the horrors of organisation simply melted away. The wedding was perfect. We flew both sets of parents out and had the most beautiful day. Half way through the ceremony the Mayor, who was performing the service, took a phone call and we heard him say he was in the middle of a wedding so could they please call back later! 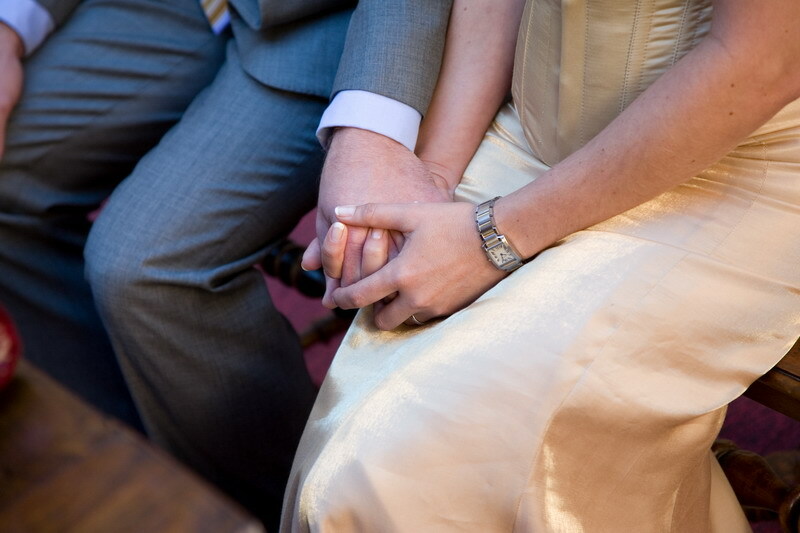 “When we were declared man and wife we kissed and there was a huge round of applause. The whole town had come out to see us and had crept in quietly and then kissed us and shook our hands as we left. It was just amazing”. Following the service the party of seven went to a local restaurant for a superb Italian dinner, complete with harpist. 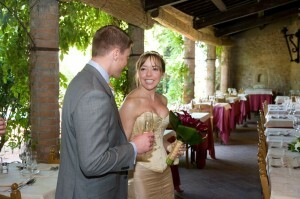 Pink Fur and flowers - Tuscan wedding for 50. 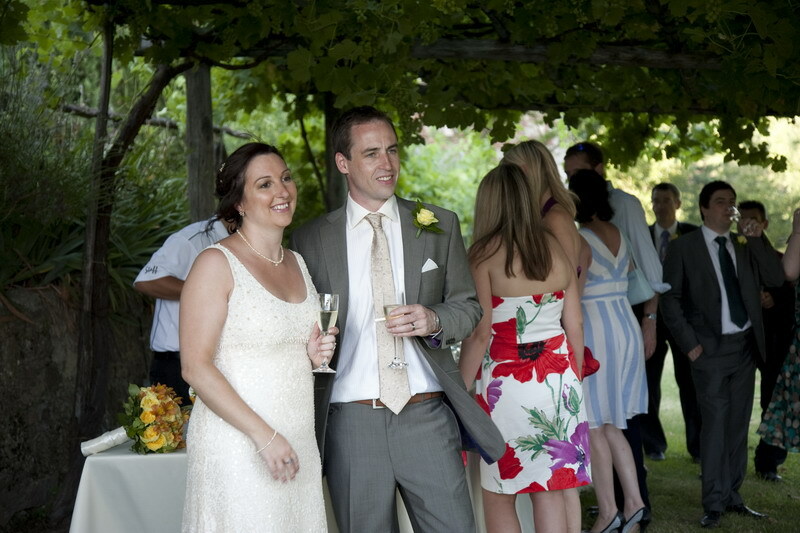 Jodie and Mike List, both from New Zealand but living in London, met over a game of football with friends on Clapham Common five years ago. 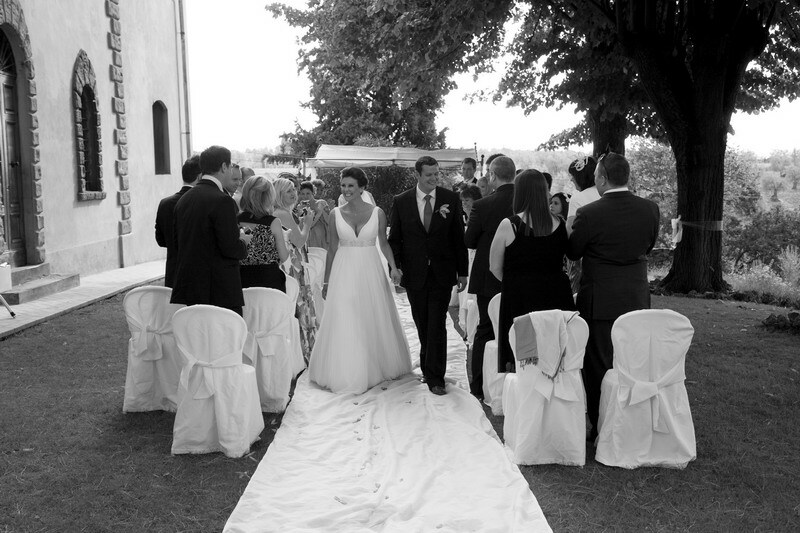 Once engaged the thought of going home for the wedding and planning everything from the UK seemed seriously stressful so instead, on the advice of a friend, they asked Erica Bellini, wedding organiser for Tuscan Dreams, to create the perfect week away for themselves and their friends in Italy. Jodie says: “The main objective was to have a relaxing enjoyable week with everyone, including our parents, family and our friends. We haven’t had the opportunity to spend that amount of time with everyone for years so it was fantastic. The couple held a beautiful reception and four course dinner for 50 people at the Villa Gambassi in Tuscany following their wedding in the grounds with an Italian priest. Babysitters were on hand for those who needed one for the evening disco and the cost included a personal hairdresser; beautician, fabulous flowers, heaps of outdoor candles and a photographer. Erica Bellini, who has organised more than 50 weddings, says: “Jodie and Mike were a dream to work with, very relaxed and great fun. 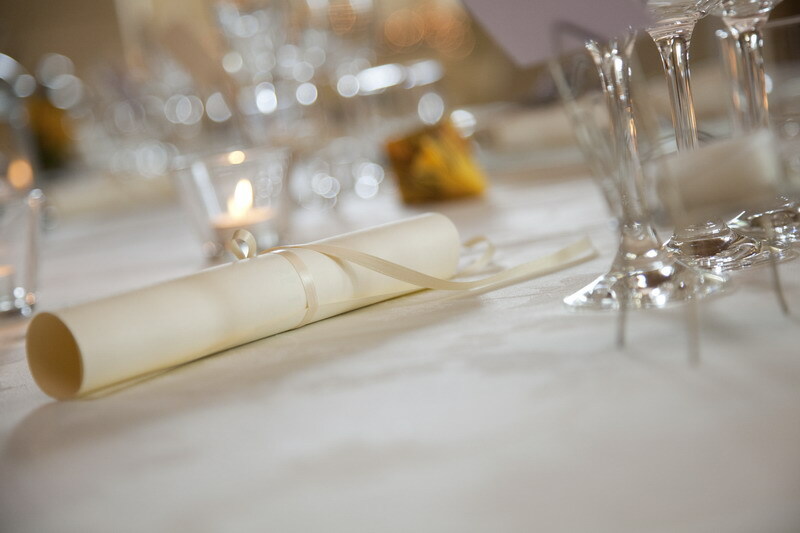 We arranged a wine tasting evening with canapés the night before the wedding and made sure everything went smoothly on the day, which of course it did”. 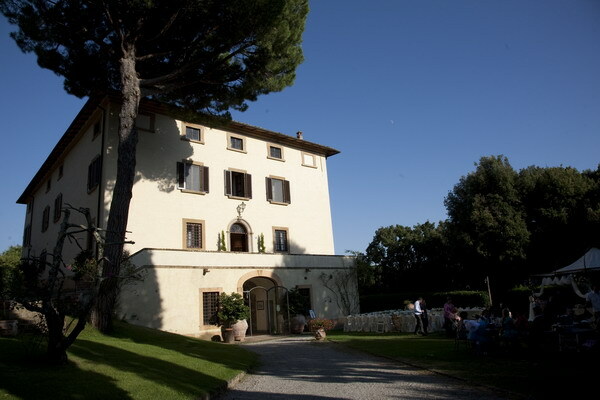 Villa Gambassi is situated in a small ancient hamlet in Tuscany. The luxury villa with a private pool is steeped in history and surrounded by idyllic countryside with several acres of oak forests. 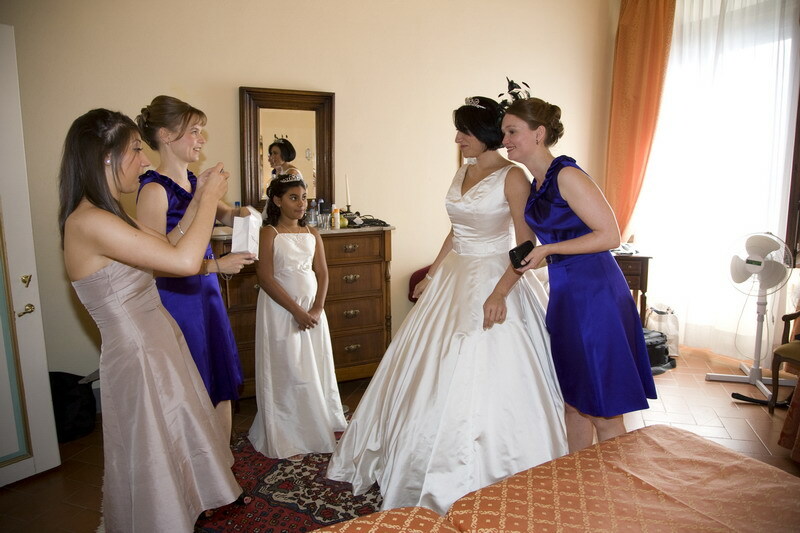 The property has been completely renovated and it is the ideal setting to organize small to medium size weddings. Villa Gambassi can only be booked through www.tuscan-dreams.com. Jodie and Mike came back to the villa with their gorgeous baby girl last year and met again with Erica. 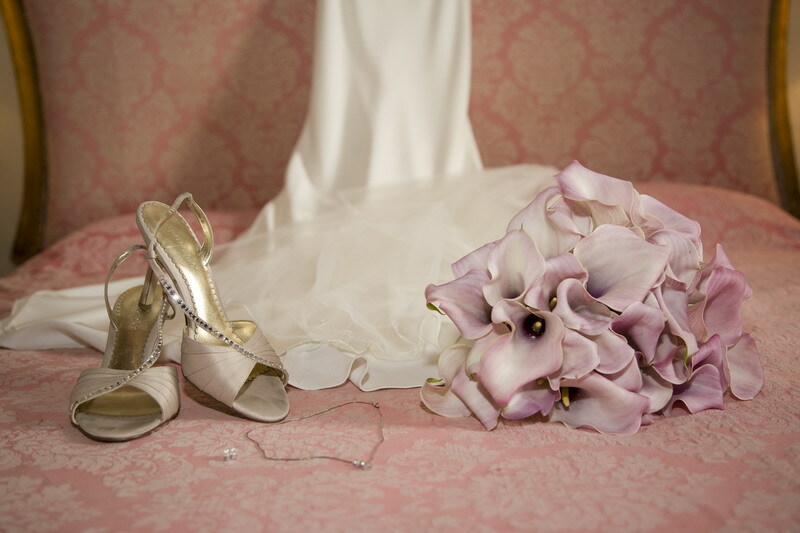 The Essential Wedding Planner’s first aid kit – What every bride needs to know! 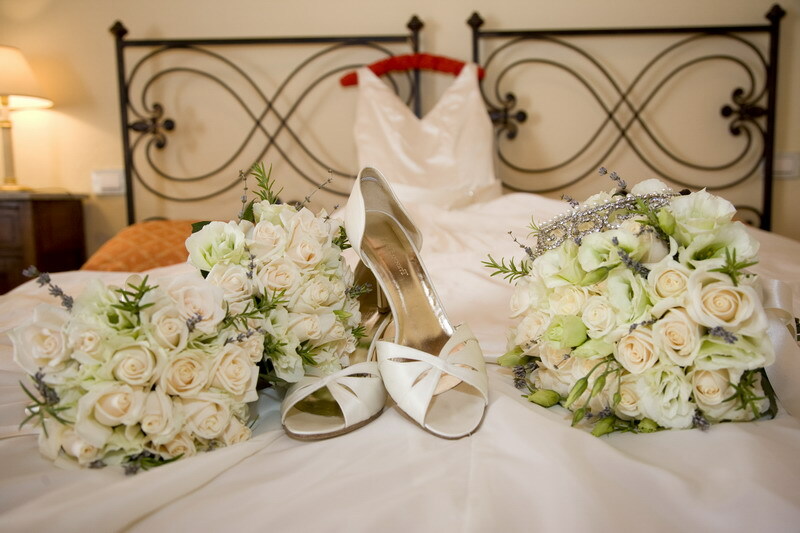 Any wedding planner worth their salt not only puts their heart and soul into making their clients big day as memorable and spectacular as possible but is also prepared for every eventuality. 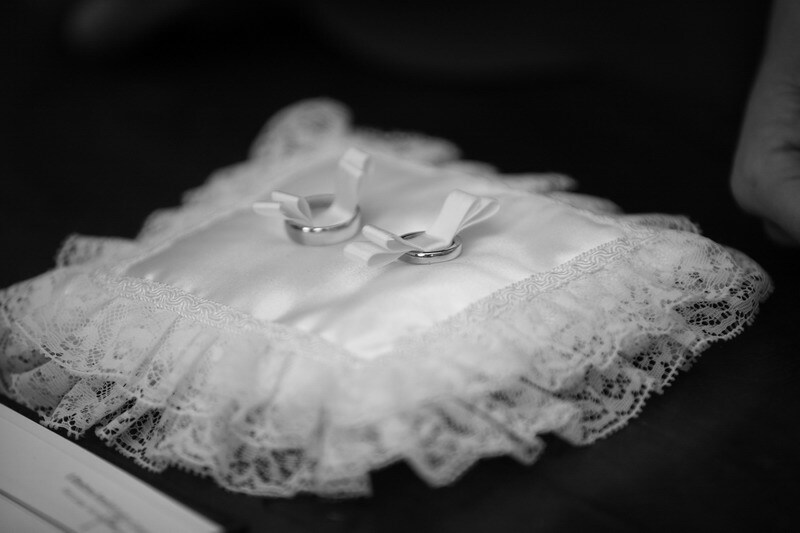 Each wedding comes with its moments of madness – The dress splits, the Groom spills red wine down his tie and the heavens open just as the bride steps out of her carriage. Never fear though, for Erica Bellini, wedding planner and creator of Tuscan dreams, is here to help. 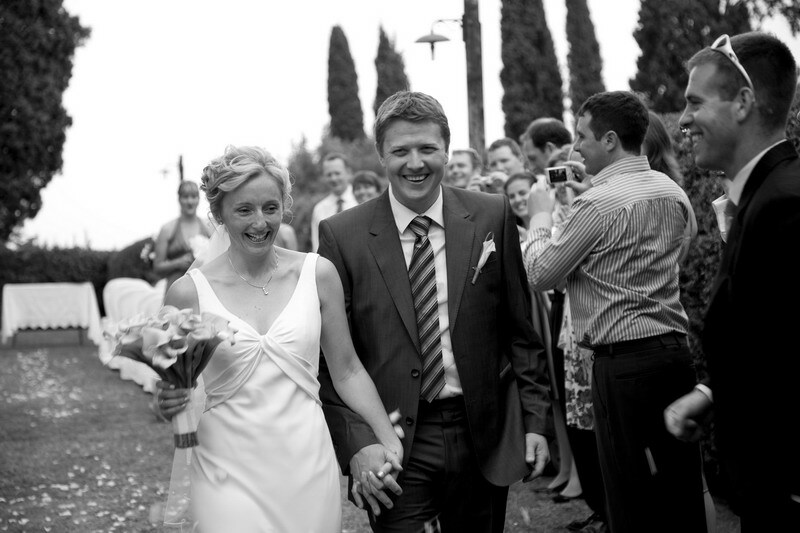 She has been planning weddings in Tuscany for over 10 years, so has had plenty of experience of wedding mishaps. Here she gives every bride a few tips to solve any last minute disasters and make proceedings run as smoothly as possible. Erica has a huge bag of props that becomes heavier by the year and her dream of becoming just like Jennifer Lopez in the Wedding Planner has come true. However, unlike the film, not everything can run according to plan and that is where Erica steps in. “I have an endless amount of equipment which grows after every wedding” she says. “If someone has forgotten or broken something it’s my job to save the day”. · Nail repair glue – This will always save a bride on the brink of tears, as every girl knows you aren’t finished without a full set of perfect nails. · A little box with buttons and safety pins – These little beauties can provide a quick fix and hold together an outfit in a matter of seconds. 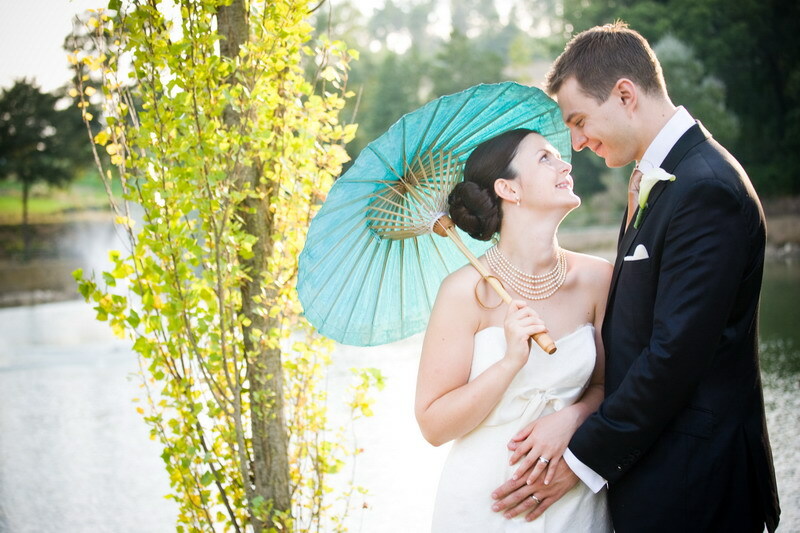 · Pretty umbrella – To protect the bride from a sudden downpour. 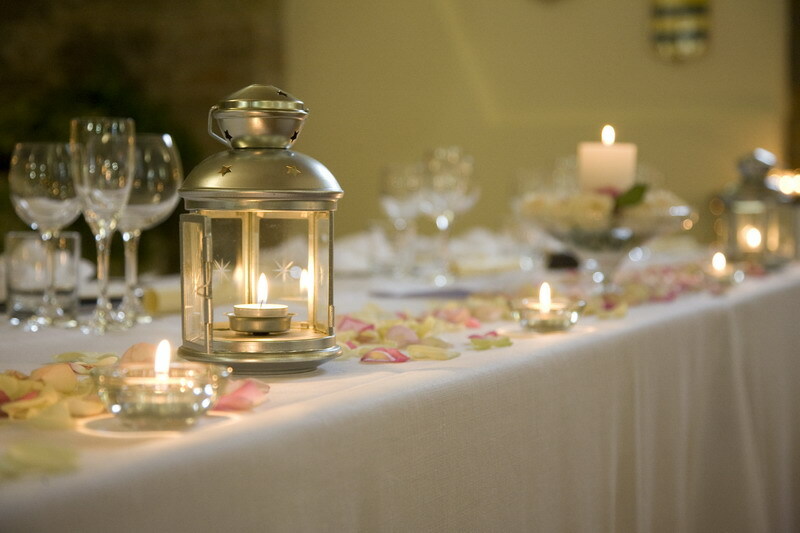 · Lighters for candles – Candles are a popular theme at weddings and so often there are many to light! 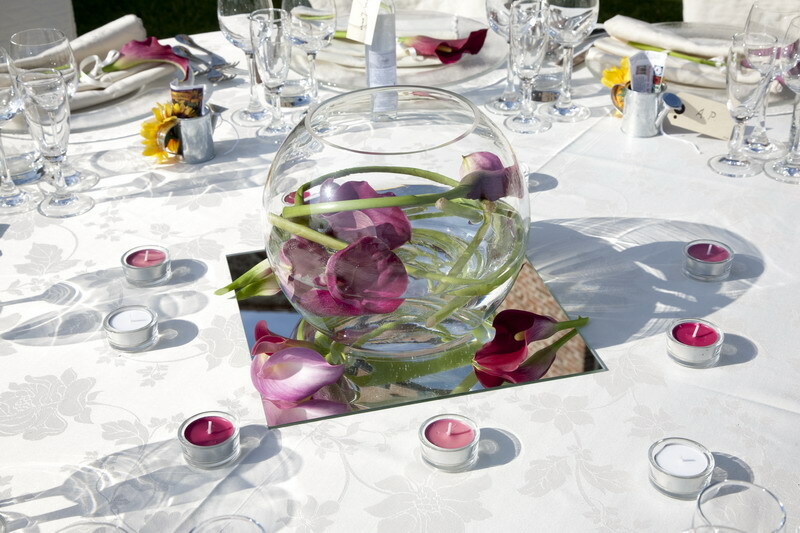 · Bottle of fresh water and a sugar cube – “Once a guest fainted right in the middle of the ceremony because of the Tuscan heat. Sugar and water have never been so useful!” says Erica. 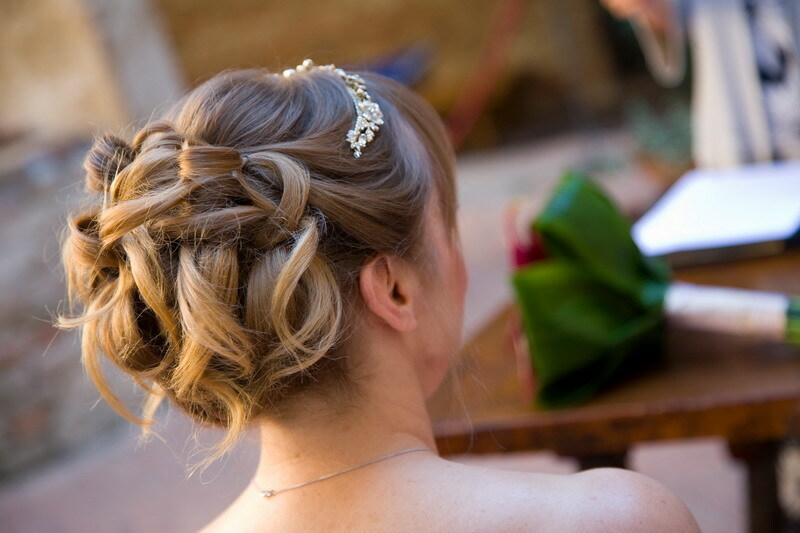 · Hair spray/grips – Not every bride has a hair dresser on hand, especially if getting married abroad, so this will help if the weather isn’t great. · Needle, thread and scissors – Probably the most important items you will have in your kit says Erica. 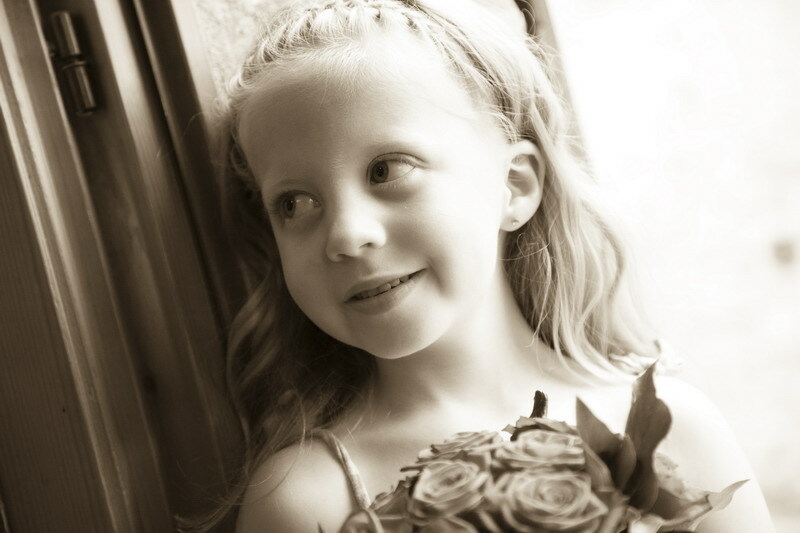 “The mother of one bride burnt a hole in the flower girls dress. 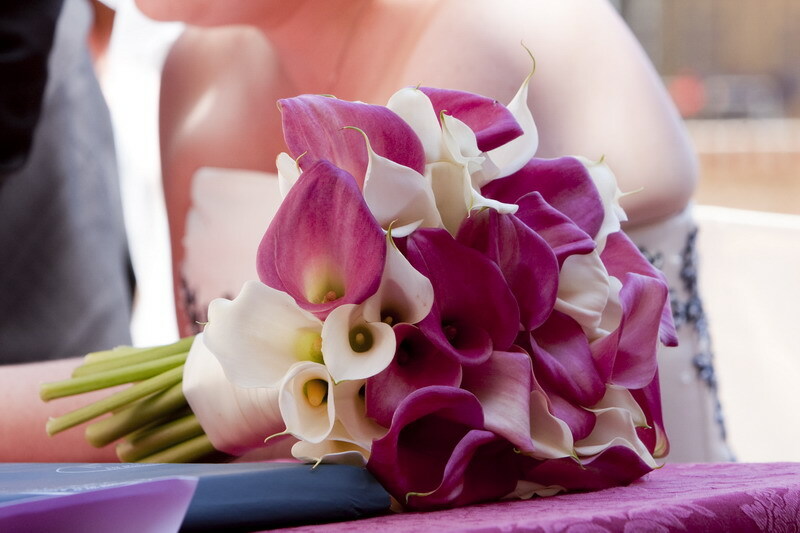 We sewed on an orchid corsage to cover the burn and the dress looked even prettier”. As Erica continues to plan and create more and more beautiful weddings every year, she continues to expand her ever growing wedding first aid kit. 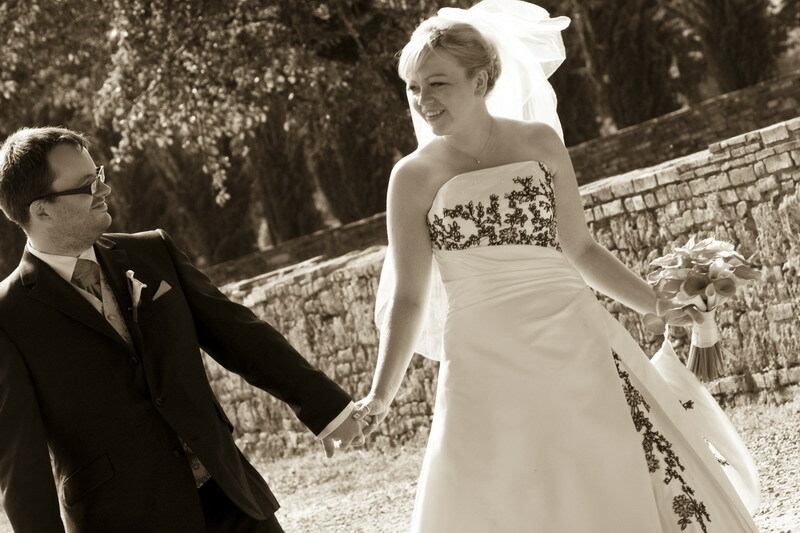 “My husband says that my next car should be a lorry so I’m able to carry everything with me that I might need for a wedding emergency!” says Erica. 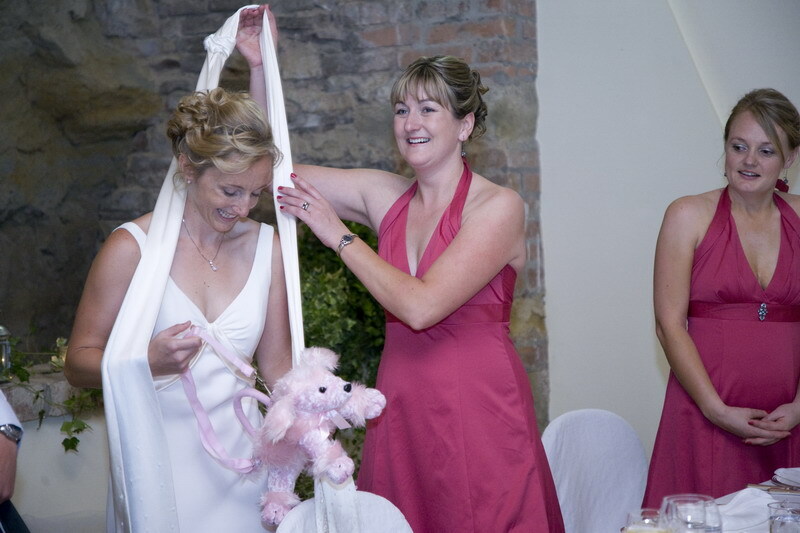 If she continues to solve every bride’s worst nightmare it may be a good investment! An Office Romance turns to Tuscany! It was an office romance that turned into a match made in heaven - but it wasn’t a lightning bolt of love as Becky explains! A year after they began dating Dan got down on one knee in front of family and friends at a Chinese restaurant in Durham and the fairy tale commenced. 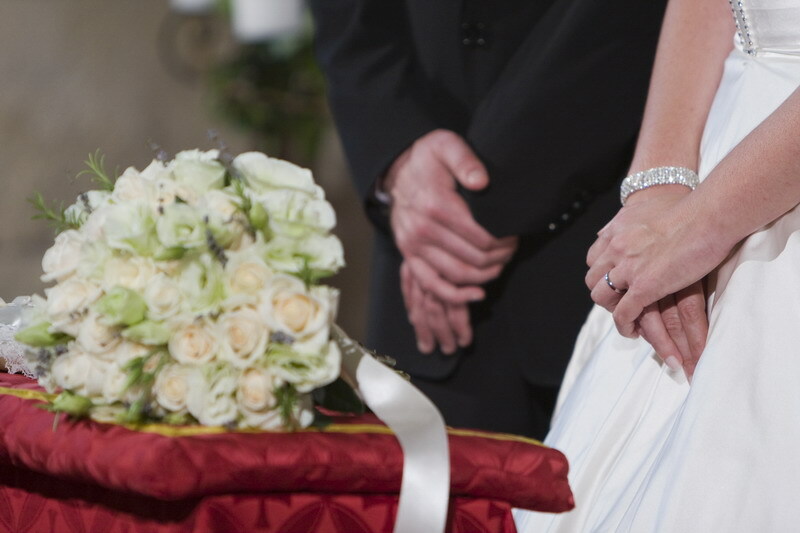 When the couple talked about getting married they held very different views. 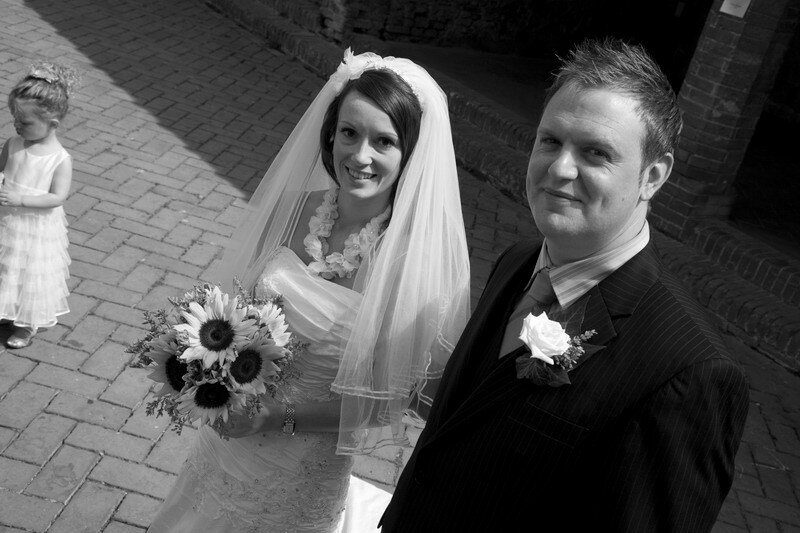 “I wanted to stay in the UK so all my family could attend but Dan wanted it abroad somewhere like Cyprus,” says Becky. 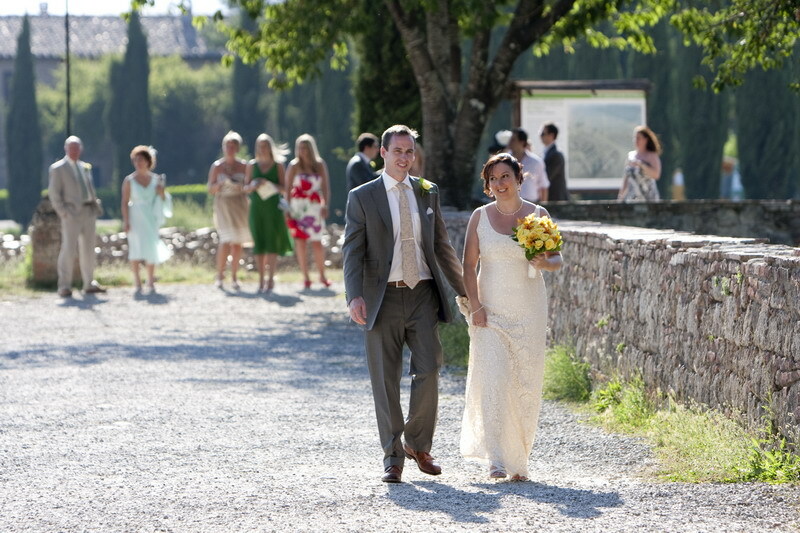 She soon came round to the idea of a wedding abroad, but wanted something more unique and that is when they came across Tuscany as a perfect location. 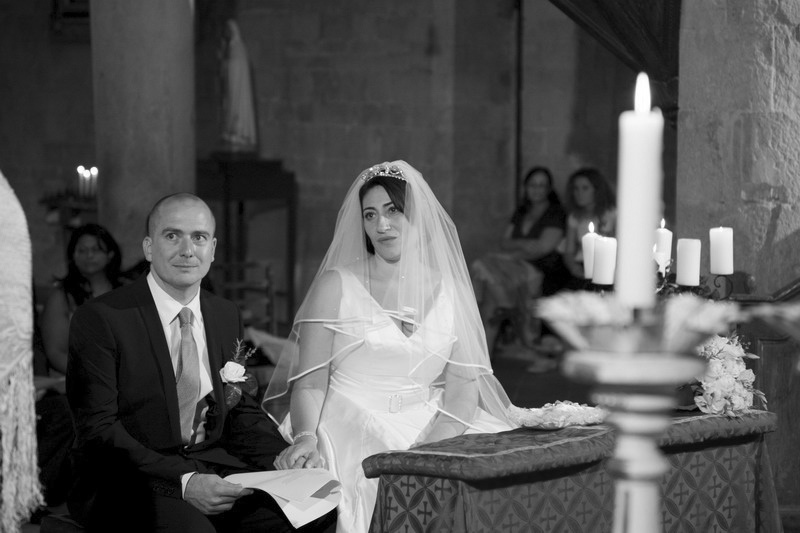 “Money was a major factor so we started to look around to see what we could get for the amount of money we could afford.” It was then they found Tuscan Dreams, the baby of Erica Bellini who has been planning weddings in Tuscany for over 10 years. With her knowledge and experience, Erica showed Becky and Dan exactly what they could achieve with their budget and it was nothing short of perfect. 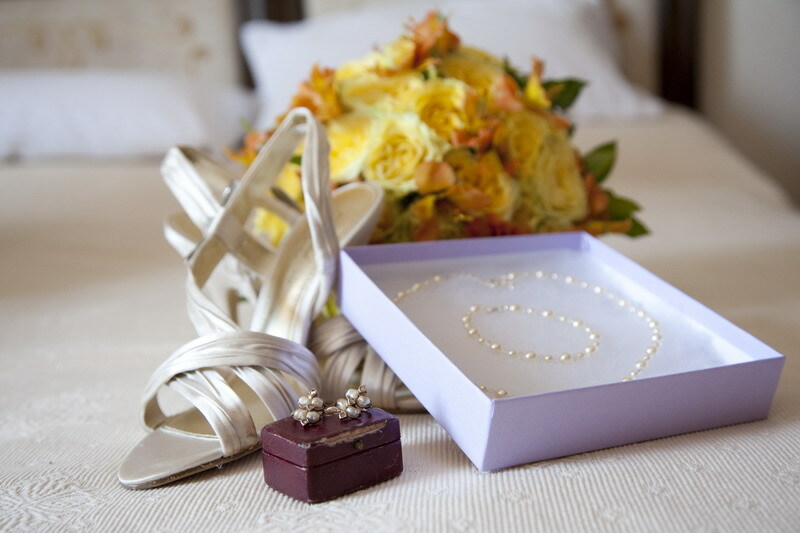 Soon a list of venues was drawn up for the couple to browse and one stood out in particular. 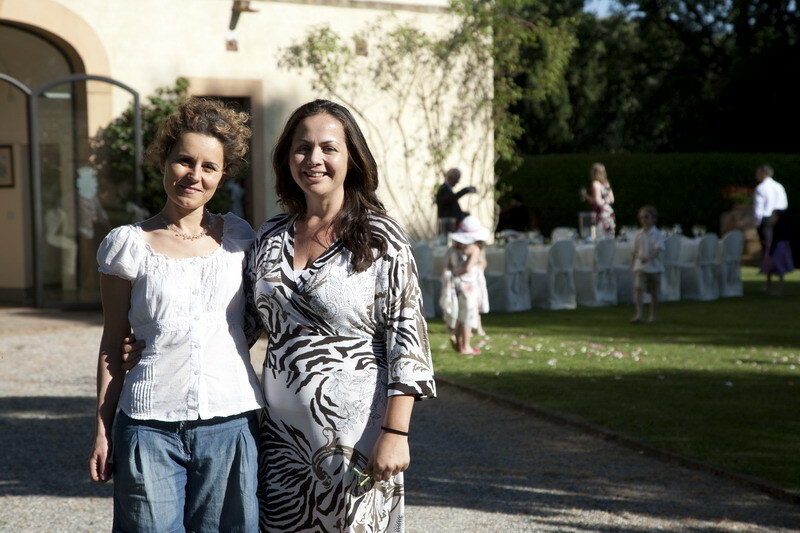 “The second we saw Villa Gambassi we fell in love with it,” says Becky. 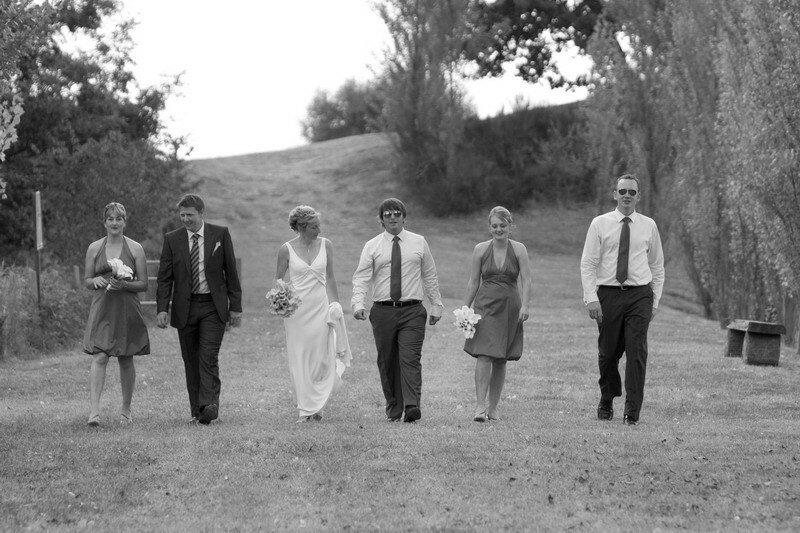 “Erica sent us details and photos from previous weddings just to re-enforce our choice. It was just so beautiful.” Right from the beginning Erica and her assistant Nicoletta, made sure they got to know the couple inside out. “They just seemed to know what we would love. All I did was arrange the bridal parties outfits, everything else Tuscan Dreams took care of.” Wild flowers and an Italian rustic feel gave the event a sense of everything the couple loved about Tuscany, beautiful and romantic yet simple and original. 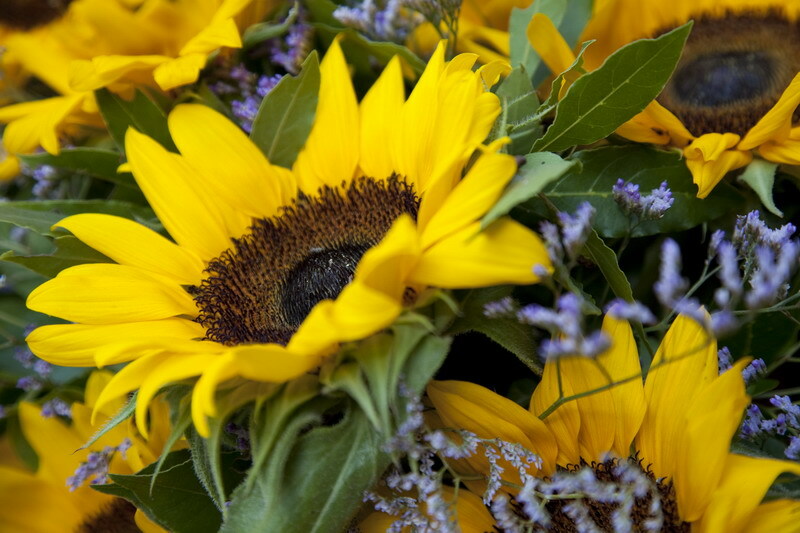 Traditional floral colours such as purple, yellow sunflowers and cream were used to set the mood. 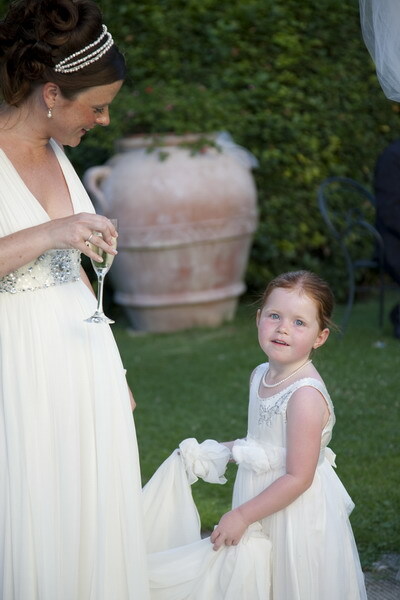 After their dream wedding in Tuscany what can Becky say about the wonderful women who made it possible? “The work they must have to do to make people’s perfect day perfect is amazing and believe me they do make it perfect in every way and more,” said an extremely blissful Mrs Gill. 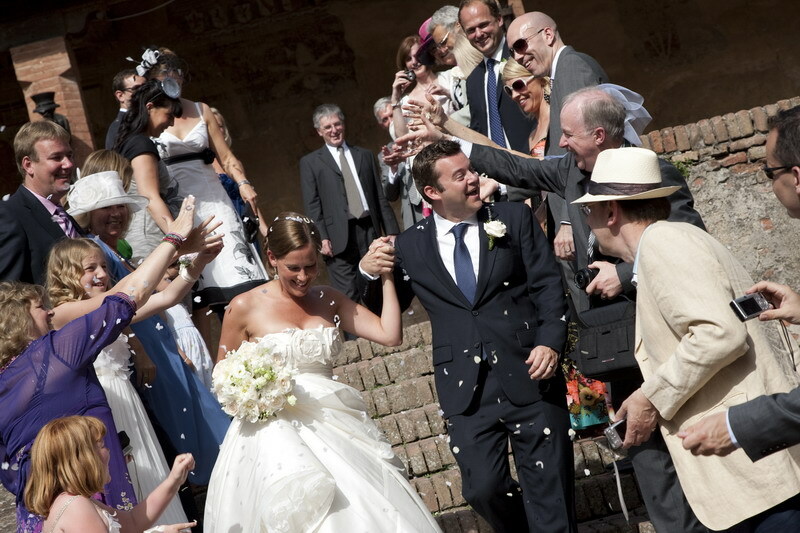 Becky and Dan got married at Certaldo Town Hall on 4th August 2009 and had reception for their guests at Villa Gambassi. 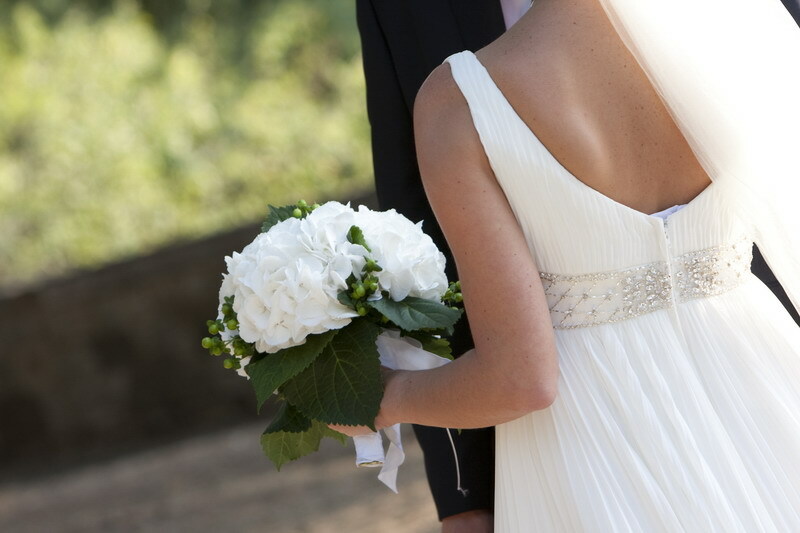 Travel Experts turn to Tuscany for their dream wedding! 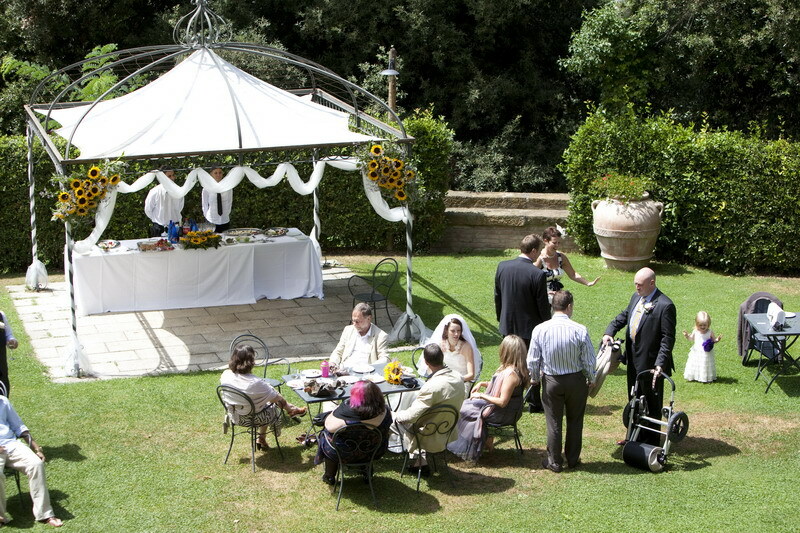 Where do you go for the most important day of your life if you are an expert on finding perfect locations? Travel experts Chris and Laura from Peterborough became engaged in Paris but knew Italy was the only place to hold the wedding. 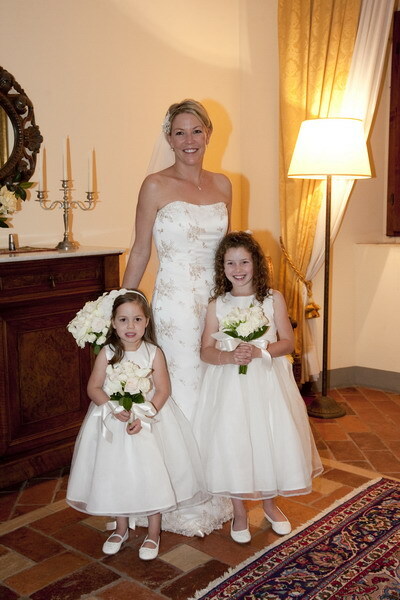 Despite being experts on the region they visited wedding fairs, reviewed countless magazines and then hired Erica Bellini, Tuscan Dreams wedding planner, to create their perfect day in the Tuscan hills. 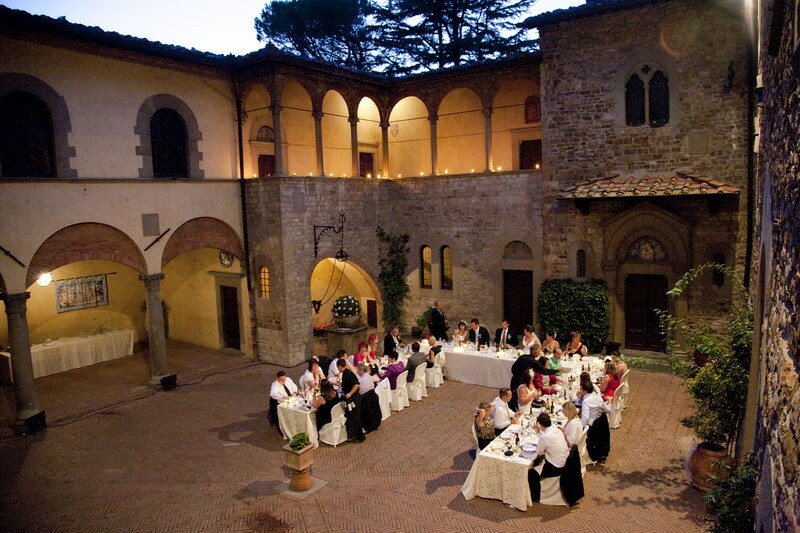 Thirty guests travelled to Tuscany for cocktails, a seven course Italian feast including truffles and lobster and dancing by moonlight in the square of Castello di Firenze. Laura said it was a fairytale wedding. She says: “We got married on the lawn overlooking the vineyards and then partied the night away in the candle lit court yard. 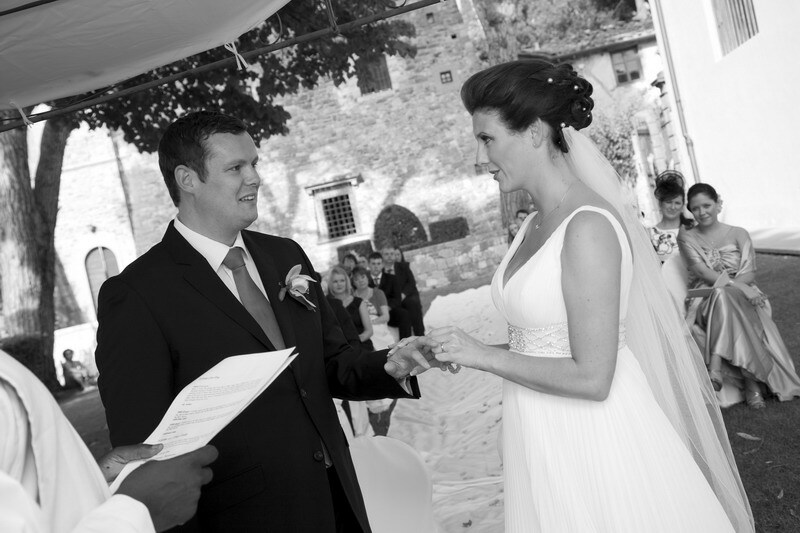 We wanted the day to show our guests why we loved Italy so much and the fantastic food, gorgeous location and great entertainment made it perfect – our guests are still talking about it and say it was the wedding of a life time”. Laura says her one tip to future brides is to keep making lists as there is so much to plan and it is so easy to forget details. 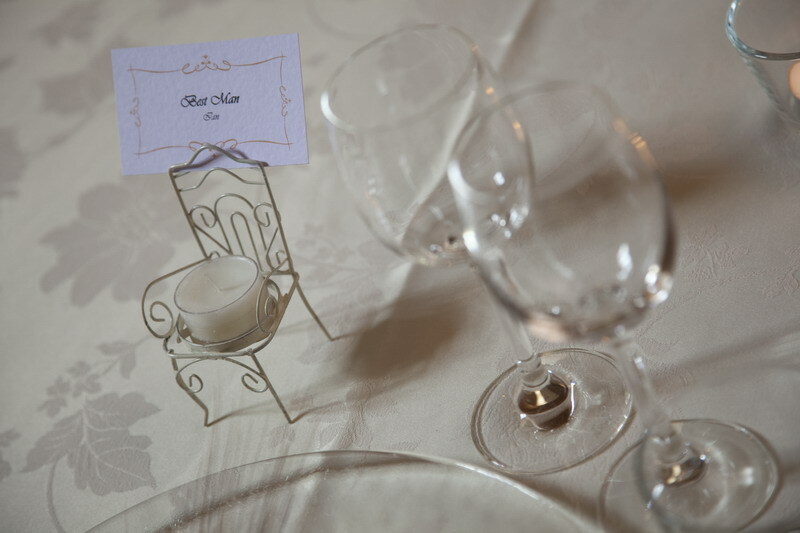 She made her own Order of Service cards using small ivory pearls and green ribbon to match the colour theme of the wedding which was chosen to pick up on the beautiful surroundings of the castle. WHY LEAVE THEM AT HOME? 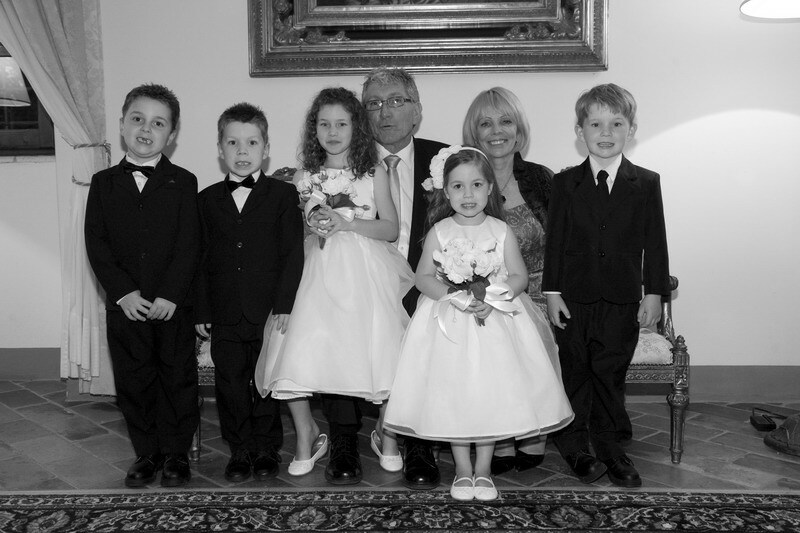 With the majority of wedding parties over the age of 30 it is almost guaranteed that some children will be present on your big day. A lot of couples would feel rude excluding children from the occasion, especially when a lot of newlyweds have babies themselves before they are even married. Some guests may choose to leave them at home with a grandparent or nanny, but what happens when the wedding you are invited to is abroad? Most parents would not want to leave their little ones for long periods so why not use it as an excuse for a family holiday? With the help of professional baby sitters and entertainers children can safely play outside in the warm Tuscan sunshine, allowing parents to enjoy the day without worrying. 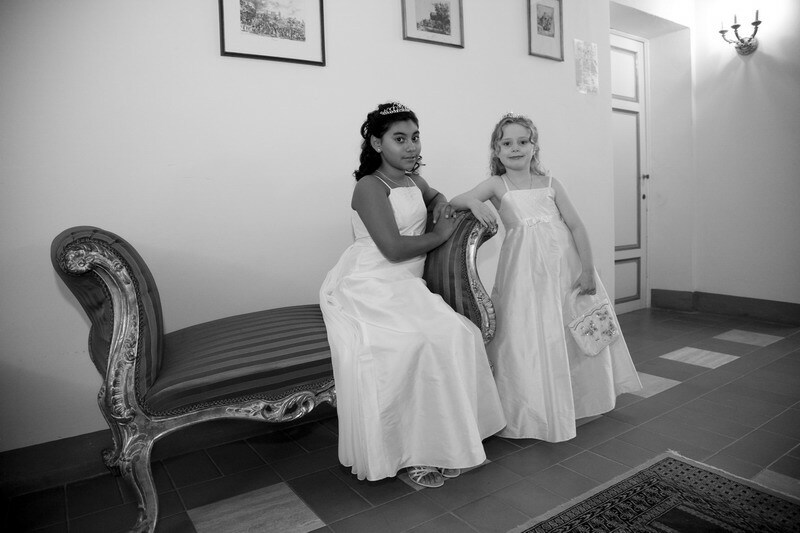 Villa Gambassi is a perfect location for a large party with children. Guest accommodation is situated opposite the villa and the fact of not having to use transport to get to it makes its a lot easier for parents, knowing that their little ones are comfortably asleep in their room only a few metres away. Buy boxes of toys and non-messy creative items to help keep them quietly amused. Don’t save on baby sitting/entertainers. Make sure you use professionals especially if 1 baby sitter/entertainer will look after more than 1 child. Arrange for the entertainers to be close enough to the parents but also far away enough so that they don’t rush to the parents every time they fancy. An idea is to have the children on a lawn on a sunny day to get plenty of exercise as well. 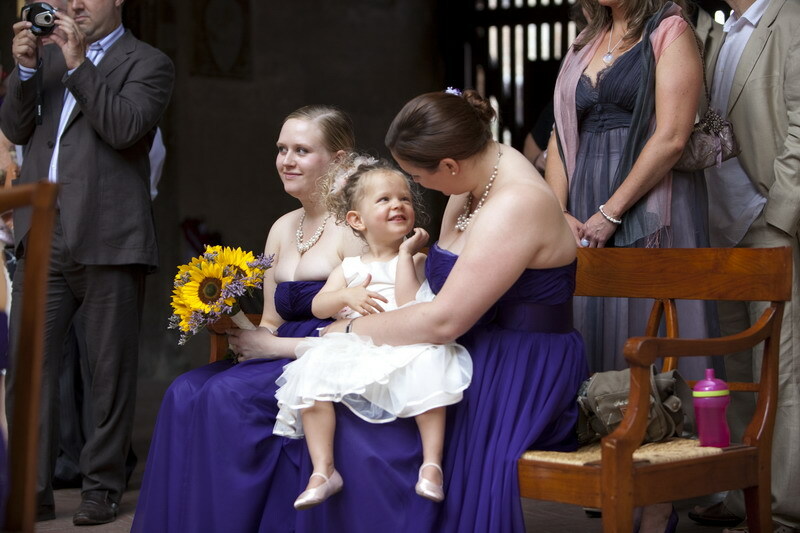 Make sure the entertainers and baby sitters are specialised for the different age groups of the children. 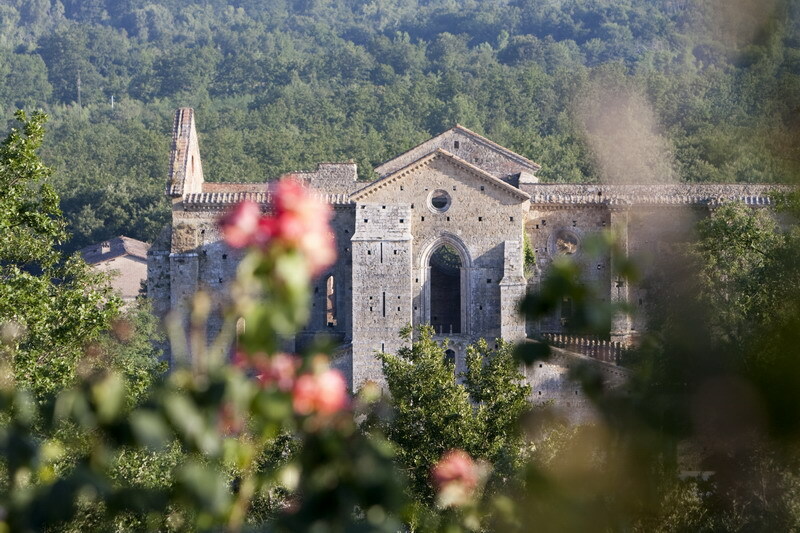 Return to Tuscany – where they fell in love! It was on a two week trip to Italy that long term friends Stephanie Grundy, a 29 year old communications officer and Christopher Sykes, a 32 year old Solicitor, fell in love. So it seemed only natural for the Manchester couple to go back to the place it all began for their wedding. 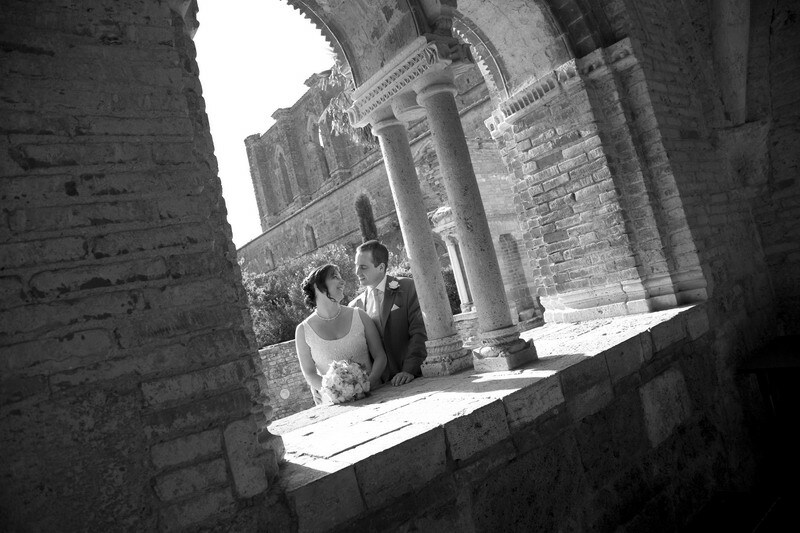 This month they travelled with family and friends to San Galgano a beautiful roofless abbey in the Tuscan countryside for their gorgeous Italian wedding and are planning to return next year for their first anniversary!